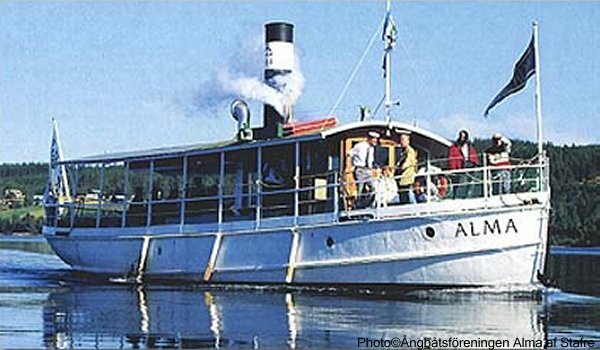 Steamboat Alma is one of Sweden's oldest working steamboats. She was built in Stockholm and transported in parts to Stavre in Jämtland for reassembly. The client was a forestry company Skönviks Ltd and in the year of 1873 Steamboat Alma would charter the Revsundssjön with goods and passengers, but in 1908 she was converted into lumber towboat for inclusion in the newly created floating Corporation. Steamboat Alma also was utilized as a church-and pleasure-boat during the floating off-season association. Steamboat Alma was originally equipped with a 15 hp single cylinder steam engine but 1908 that steam engine was replaced by a 80 hp compound steam engine. 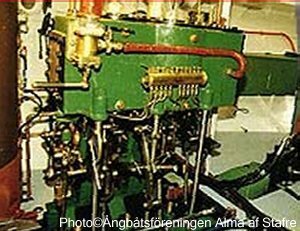 In 1913 the old boiler was replaced by modern Scotch marine boiler. Although this Scotch boiler has nowadays been replaced by a smaller compact boiler to make space for a dining room below deck. During the renovation of the Steamboat Alma, the years 1990-1993, the goal was to maintain her in as original condition as possible. Steamboat Alma's exterior is thus unchanged, and most of the interior is restored to original condition. Steamboat Alma compound steam engine. The steam chests at each end of the engine is very typical for engines with Stephenson's link-motion.